Home Judicial Conferences CJP said provision of justice to public is the need of the time. ISLAMABAD: Chief Justice of Pakistan Mian Saqib Nisar said on Friday the timely provision of justice to public is the need of the hour. The CJP was addressing the eighth judicial conference. 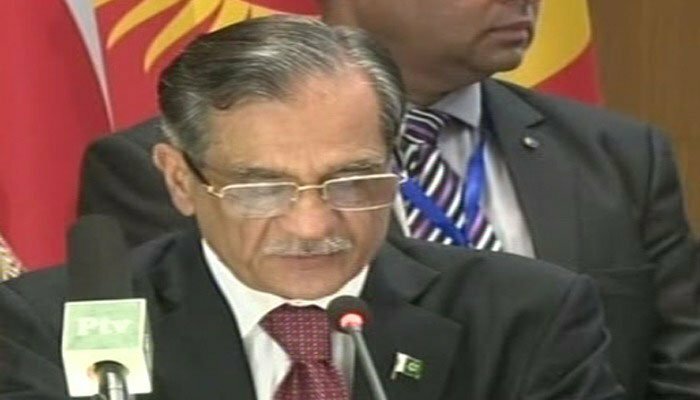 Justice Saqib Nisar said that according to the Constitution’s Article 37, the indiscriminate dispensation of justice to citizens should be ensured. The CJP said due to the China-Pakistan Economic Corridor plan, foreign investment will increase in the country and to derive benefit from the project all the elements should be kept in consideration. Justice Saqib Nisar said that for the welfare of the public, justice plays an important role. He said that the rights of the citizens as per the Constitution should be safeguarded. The CJP added that the provision of justice is the judiciary’s basic responsibility. - Resource Geo News.